Just beyond Enghave Park and below the site of the Carlsberg Brewery and called Humleby - literally Hops Town - the houses were not built for the brewery but for the Workers’ Building Society, to provide healthy homes for the workers at the engineering company of Burmeister & Wain. They are of two main storeys but with rooms at attic level. The row houses are generally 3 windows wide - strictly described as 3 bays wide - although that does tend to cause some confusion as people then imagine bay windows. Drawings in the national archive include plans that show some of the houses with rooms on the first floor marked as kitchens which indicates that some of the houses were not single family homes but had at least two apartments. Earlier estates of workers housing were similarly divided with either ground and first-floor apartments or even divided along the central spine to form front and back apartments. The middle houses of each main row have steep gables to the street and the end houses have tall gables not only to the street but also at the end towards the street at right angles and all with windows - some paired and some round headed - to light the attic rooms. All the intermediate houses have dormer windows. The majority of the houses have a front door against the party wall and two windows to one side and with three windows lined up above but the end houses have a central front door flanked by single windows but again with three windows to the first floor. There is a hierarchy of window treatment … the corner or end houses generally have semi-circular arches in brick headers above the window that enclose a blind panel so the windows themselves have square tops but the intermediate houses have segmental heads or shallow brick arches above the windows. Front doors have a round-headed arch over a recessed panel of brickwork with a segmental arch immediately above the door … a simple but well-executed pattern of brickwork showing the skill of the bricklayers but also showing an appropriate restraint. 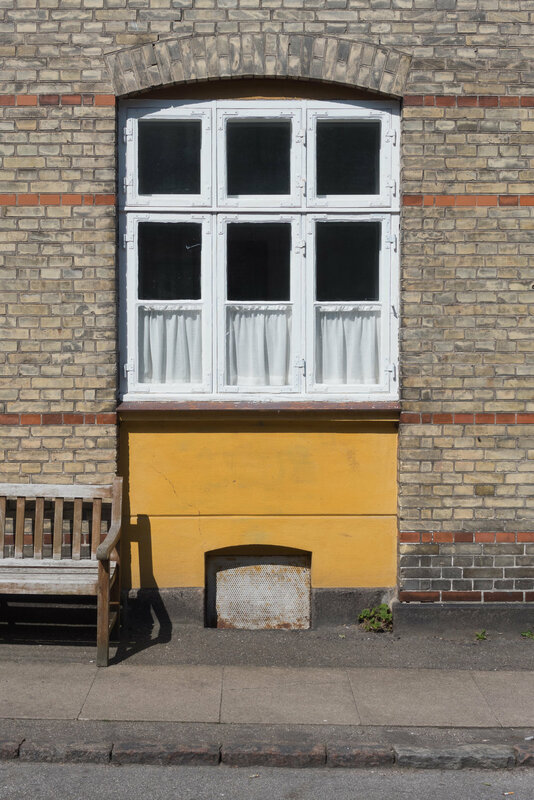 The main brickwork is pale or yellow stock but there are courses of red bricks used to form horizontal bands that run across the full frontage so there are two bands below the first-floor windows, courses of red bricks at the eaves and across the gables but, more interesting, short runs of red brick between the windows at the level of the transom. The windows copy the arrangement of so-called mullioned and transommed windows found in medieval buildings but most common in buildings from the 17th and early 18th centuries. A mullion is a vertical element that divides the window and the transom, or transoms on larger windows, run across. Here, those features are expressed in the framework for wooden casements. The use of these features display a careful balance … they are a clear sign to show that the architect and bricklayers knew exactly what they were doing and understood established styles and conventions but were, essentially, showing that although these were houses for workers they were well built and of a good standard. Flues for stoves are taken up at an angle from the front and the back rooms to break through the roof at the ridge with brick chimney stacks but the cross walls are also taken up above the line of the tiles with a capping of curved red tiles so the roof is not a single continuous run down the whole row. Again this is in part decorative and also shows that the individual houses are clearly marked and expressed but also this is an important structural feature … with the brick walls taken right up to the ridge, they form a fire break or barrier. After all, Copenhagen had suffered from a number of catastrophic fires where whole streets and then blocks and the quarters of the city were lost as the fire moved from house to house and often at roof level. The main part of the Humleby plot is about 250 metres deep - running back from the west side of the main road Vesterfælledvej - and is about 120 metres wide with two long roads - Carstensgade with houses on its north side looking in towards the other houses and Küchlersgade along the south side of the plot with houses along its south side looking in towards the other houses. Between these streets are five cross streets - Lundbyegade, Ernst Meyers Gade, Bissengade, Jerichausgade and Freundsgade - with rows on both sides so the houses face east or west. All the houses have small front gardens with low fences or hedges and between the rows, in the relatively narrow space between houses, there are back yards. In each yard there was an earth coset or toilet in a small outbuilding. 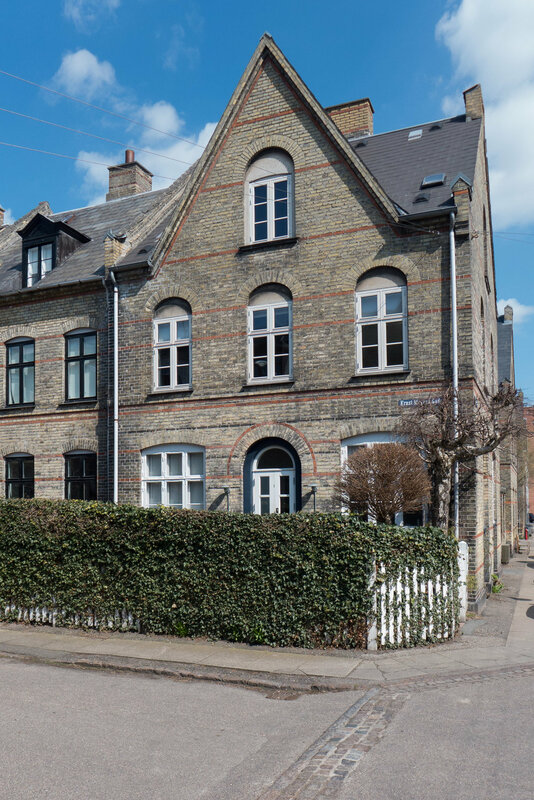 Jerichausgade, the second cross road in from the west, continues on beyond Küchlersgade and continues at a slight angle to join Ny Carlsberg Vej with rows of houses on both sides. The streets of the Humleby estate are named after painters and sculptors … again, presumably, a deliberate choice to show clearly that not just middleclass families but also workers could and should have aspirations.